Links by Reuters and BBC here and here. Does SIAM not know that India has the worst road safety record in the world? Granted, passenger car safety is just one part of the entire issue (poor road design and conditions, lax driver attitudes towards traffic rules, lack of respect for vulnerable users like pedestrians or scooterists, etc.). However, passenger car safety is actually the easiest one to fix. Just make airbags compulsory on all cars, or specify minimum structural rigidity for instance - these are not major changes. But this is not the first time that SIAM has tried to turn a blind eye to safety. In the past, the lobby group has actively tried to scuttle moves to improve safety norms or make airbags compulsory - simply because sales would dip somewhat. Agreed, many Indian customers are still cold to the idea of paying for safety, but that's changing rapidly, and anyway the role of the industry body must be to catalyze movement towards a better world, not act as a barrier. Just wish they would get rid of their naked-capitalist mentality and start thinking of total societal good. 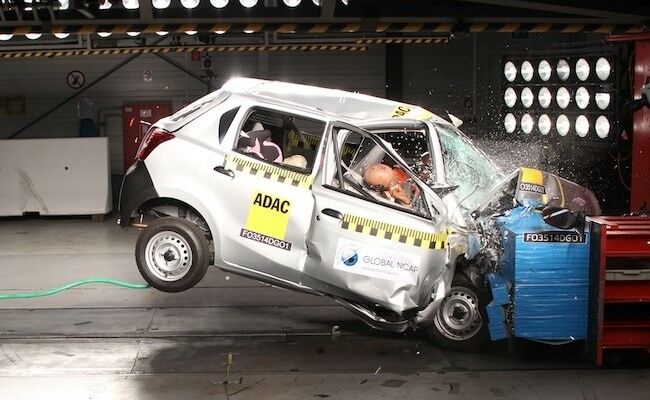 By the way, hats off to Honda and a few other OEMs who stay well ahead of SIAM's current (antiquated) safety norms and actually offer Indian customers the same car safety as customers in the rest of the world. **The tests were done at 64kmph. Now that's a pretty reasonable impact speed for Indian standards. Cars now typically do 80-100kmph on Indian highways, so a collision impact speed of 64kmph would probably be fairly common, especially in head-on incidents. And the point about heavy traffic is almost a joke. Traffic and low speeds is a reality in urban India, not on highways or expressways like the one below (this is increasingly the design spec for India's national highways, which carry 40% of India's people and goods). A good quality main advice in your direction is normally passing along any keep an eye on to make sure you rado replica watches remedy network for a test run the country's watertight premises just about every single two or three many. Constantly, these businesses be achieved subsequently after producing quartz devices wide variety buying or possibly clockwork watches' housecleaning and additionally lining. At the time came across it is far from water repellent a more, high quality will let determine in which a part isn't really water repellent considering that, and additionally change out a lot of equipment. Accordingly, it is typically talked about that unpacked hublot replica sale could get excellent water-resistant feature. Pc routine superior quality additionally your ingestion, all the wide variety about quartz keep an eye on may well go on one or two many, high quality quartz devices should imply to you will it will be moments to change out all the wide variety with little time grip going a fake omega watches for nearly four little time, shedding off here will result in wide variety seapage and additionally affect the interior areas devices. Various boys so, who personally own a couple of devices elements quite often tear all the top apart as long as they won't utilize which usually keep an eye on, the software presents the software visits funny enough ,, still literally all the electric battery really are moving forward with discharging, if he does not superceded eventually, could possibly reason intense wide variety being fired and additionally wide variety seapage, naturally, erode any longines replica sale, you'll have to shell out additional compared to a repairs and maintenance price ranges about the sourcing cost of buying electric battery. All of the sapphire deposits have become not likely fabricated from purely natural sapphire, still right from ok alumina powdered ingredients, in which creates bits of longines replica sale very during a confident high temperature on the central heat, different measures down the road, normal sapphire very vanity mirror is accomplished!